Working or playing hard depletes precious nutrients and takes its toll on the body. Whether you are a professional, amateur, or recreational athlete, your body needs more nutrients than your counterparts who are not working out. The muscles of the body are stressed and deplete more necessary nutrients when they are utilized above and beyond normal daily activities. In our achievement-focused society, children are becoming extremely active in sports from a very young age. It is not uncommon for youngsters as young as 10 years old to be engaged in practice for a select sport five to six days a week. Gymnastics, swimming, karate, basketball and baseball come to mind as immediate examples requiring this kind of dedication. While it’s a reasonable discussion as to whether or not that is good for the child’s psychological or physical health, the fact is that high level youth sports are here to stay. As a parent, it’s our job to monitor their activities and keep our kids healthy and well rested, no matter what their athletic passion is. That’s where Shaklee can help. Shaklee Sports Nutrition products are used at the highest levels of competition and are packed with nutrients for all ages, so you can trust them every time – before, during and after workouts. Shaklee products are proven to help athletes train longer, recover faster and perform better. These are all natural products with no artificial flavors, sweeteners or preservatives. Everything you feel good about giving to your kids – or yourself – and nothing you don’t. Even though a family dinner is everyone’s goal, some nights you just need to grab a meal-in-a-bar (rather than fast food) and go! Shaklee offers chewy bars packed with the healthful nutrients a hard-working body needs. They are loaded with protein and fiber to help keep you feeling full and satisfied for hours, plus Leucine to help the body retain lean muscle.Shaklee Meal Bars are Gluten free with no artificial flavors, colors, sweeteners or preservatives added. They come in delicious flavors including peanut butter/chocolate chip, blueberry/almond and chocolate cinnamon. As young athletes move into their high school years, sports compete with new time demands. Just as a coach’s time commitment and performance expectations grow, so do demands from the rest of life. Juggling school, social relationships, family responsibilities and part time jobs can take a toll on maintaining healthy nutrition. Kids are going to seek sources of quick energy, no matter how many times we tell them to just get enough sleep at night. Rather than watching them drink unhealthy energy drinks, Shaklee provides a truly clean burst of healthy energy with Shaklee Energy Chews. While helping to sustain energy, alertness and sharpening focus, each Energy Chew delivers a scientific blend of caffeine from natural green tea extract, plus L-tyrosine, L-theanine, B vitamins, and vitamin D. There are no artificial flavors, sweeteners or added preservatives that you’ll find in other energy products. Logan Henize, a native of West Chester, Ohio, used them for his level of competition in high school tennis. Shaklee also offers support after the work out is complete. Shaklee Performance Pure Hydration Drinks -in tasty lemon lime and orange flavors – support optimal hydration and help to Increase endurance. Shaklee Performance is clinically proven to hydrate better than water and also offers more electrolytes and more energy than the leading hydration drink. Our proprietary OPTI-LYTE™ electrolyte blend plus our unique mix of carbohydrates delivers instant and sustained energy and supports optimal hydration. Covering the nutritional needs of athletes is part of the puzzle to keeping kids healthy; taking care of their aches and pains is another aspect. Many of us who grew up before today’s sports-focused youth – i.e. the middle aged among us – have more recently made an adult commitment to a sport or fitness regime. Starting something new at a more advanced age plays even more havoc on the body! Whether it’s tennis, golf, spinning, running, cycling, aerobics classes or weightlifting, we typically experience soreness after a workout. 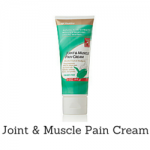 Shaklee Joint & Muscle Pain Cream provides temporary relief in minutes. It’s deeply penetrating to target arthritis pain, backaches, sore muscle, sports injuries and more. This non-greasy, menthol formula enables fast absorption and provides prolonged release action to affected areas. Nutrition Help on the Go! Of course, in our busy lives we are also trying to fit exercise into the rest of our adult commitments. That can mean more meals on the run! Three of Shaklee’s most popular nutrition products that can easily be incorporated into daily life are Shaklee Physique Pure Recovery Shakes, Shaklee 180 Energizing Smoothees and Shaklee 180 Snack Bars. Shaklee Physique contains the right amount of protein and carbohydrates to help you recover faster and optimize muscle rebuilding. Its intelligent-release protein blend and unique protein-to-carb ratio allows your body to absorb a full spectrum of amino acids over time, helps build firm, lean muscles while restoring muscle energy and supports muscle repair. Its natural banana flavor offers no artificial flavors, sweeteners or added preservatives for a sweet, guilt-free treat. Shaklee 180 Energizing Smoothes deliver the goodness of a meal to help you power through your day. Non-GMO soy protein or whey protein and fiber help keep you feeling full longer while added Leucine helps your body retain muscle so your metabolism can power on. It offers 24 grams of hunger fighting protein, 6 grams of fiber, no artificial flavors, sweeteners or preservatives and is gluten free. Shaklee 180 Snack Bars are loaded with protein and fiber, to go a long way in curbing hunger and keeping the munchies at bay. They offer 9 – 10 grams of hunger fighting protein, Non-GMO soy protein, no artificial flavors, sweeteners, or preservatives added and gluten free in several great flavors. If sports are part of our daily lives, watching sports is probably another past time we enjoy. A number of Olympic athletes utilize Shaklee products for top level results. In fact, Shaklee has created a Pure Performance Team to extend its commitment to world-class athletes. This group of elite athletes, led by 2008 Beijing Olympic Games competitor and pentathlete Eli Bremer, has been handpicked from a variety of highly competitive sports. Eli has been using Shaklee products since high school because he knows they are pure and helped him perform his best. Eli has become the Team Captain of Shaklee’s Pure Performance Team as a way to educate Olympic athletes on the positive and negatives of taking supplements while competing. Hoping to Return in 2018? With sights set on gold, Shaklee Pure Performance Team member Kelli Stack believes she’ll return to the games in 2018 to compete again. And given her resume on the ice, there’s no doubt she’ll be back. Her collegiate experience includes her playing an integral role in helping Boston College reach the Frozen Four and first title game in 2007. Kelli was a Silver Medalist at the 2014 Sochi Games and 2010 Vancouver Games, a three-time world champion, and was named the 2012 Bob Allen (USA Hockey) Player of the Year. Over the years, Shaklee is proud to have fueled the dreams of many athletes. Shaklee nutrition products help give athletes at every level the winning edge they need to train longer, recover faster and perform better. Shaklee-powered athletes have ruled the podium, winning more than 100 gold, silver and bronze medals at the summer and winter Games. Whatever your level of competition – or that of your children – shouldn’t Shaklee be part of your training regimen? Want to Boost Your Athletic Performance? Shaklee can help you receive the nutrition and energy that your body needs to maximize your performance and recovery time. Contact us to talk about Shaklee sports nutrition.